When we first went to the Botanical Gardens almost a year ago now the most exciting discovery plant-wise was the mysterious Wollemi Pine (Wollemia nobilis). This so-called 'living fossil' was re-discovered in a dark and damp rainforest gorge only fifteen years ago and this merely 200 km away from here at an unspecified location in the Blue Mountains. One of the world's oldest and rarest trees with only a hundred or so specimens known to exist in the wild the Wollemi Pine belongs to a plant family which has to have the largest amount of vowels in a single word known to lexicography - Araucariaceae. 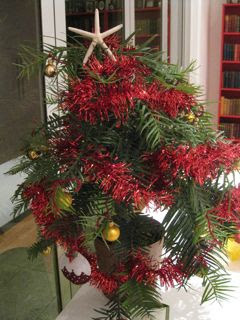 It looks somewhat like a conifer having dark green leaves with serrated edges and lots of branches. As it ages its bark starts to look like bubbling chocolate. The oldest known Wollemi Pine fossil dates back 90 million years and it is believed that the Pines may have existed since the Jurassic period 200 million years ago. Before the Pine was rediscovered in 1994, it was presumed extinct for around two million years. 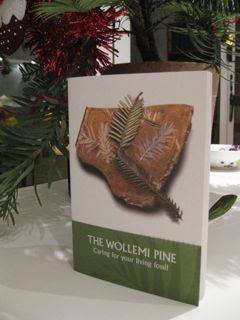 Our Wollemi Pine came with a little brochure on how to look after it, the marketing redolent of that accompanying those computer dogs or i-phone girlfriends. It has certainly made me regard it as something more than a plant. The tinsel and baubles have now been carefully removed, the single (Christmas pudding) decoration packed away for next year and the starfish that graced the top hung up in my studio. Our living fossil is now next the front door looking 200 million years old and 200 million years wise. Re-reading the accompanying literature has reminded me that I have to re-pot it before the biodegradable pot it came in disintegrates on us. It's a ticking timebomb, a cardboard explosion waiting to happen, especially in the ridiculous heat we are enduring this weekend - the sort of heat where Sniff lies with all four limbs in the air trying to get a breeze across his belly and I just wilt on the chaise longue groaning about the injustice of having to live here. The Botanical Gardens' own specimen of the Wollemi Pine seems a little sickly, or at least it did last time I saw it, lonely on a lawn. I am hoping that with the boosting of their funds from our Wollemi purchase it will receive renewed care and attention. I am also hoping that one day I will learn the secret hiding place of those 100 remaining wild trees and be able to go and see them, undercover, on a sort of covert mission, perhaps bearing some baubles and tinsel to spruce them up a bit. (Ho Ho). Anyway, as they say at the Botanical Gardens, buying a Wollemi Pine doesn't just help protect the species it will also safeguard its continued survival. So I'd like you all to go out and buy one today. Save the Wollemi Pine! Unendurable heat sounds great at the moment. Here in the US it is freezing all over, even in the Deep South where frozen iguanas are falling from the trees, not dead apparently but having retreated into some deep hibernating state, some kind of iguana 'happy place' I guess. So cold here in Boston that if you blink too slow it feels as though your eyeballs are going to ice over. Nice. Wish I was there with your Wollemi Pine and you. Ah the Wollemi Pine. We have one in Amsterdam, in the Hortus Botanicus! You must have seen it there, surely? And you can also buy the seedlings too (reassuringly expensive for such a rare and fragile specimin). Ours is little bigger than your Christmas tree and as its been growing for at least ten years, 20m may take a little while! It is protected by a rather splendid BDSMish iron cage. I will send a photo.